Increase your Lean Knowledge and Implementation know-How skills. 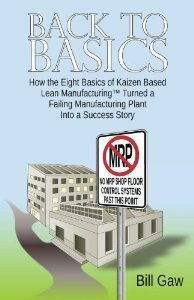 To stay current on lean manufacturing knowledge and implementation know-how, subscribe to Bill Gaw's Lean Six Sigma Forum and you'll receive his weekly solutions to the reasons why 80% of lean initiatives fail to meet expectations. And as a bonus we'll send you a download copy of our e-Book, "Thinking-Outside-the-Box.". (All at no cost of course.). Your personal information will never be disclosed to any third party. "Great manufacturing management articles. Thanks for the insights. I often share portions of your articles with my staff and they too enjoy them and fine aspects where they can integrate points into their individual areas of responsibilities. Thanks again."